The bhajan board includes all bhajans from our bhajan book. As the board is in constant progress it also includes a “News & Updates” section, which allows members to receive informations about new content as soon as it becomes available (such as new audio or video files, or when Sabeena has written new in depth material about a bhajan). Our goal with this board is to give access to all relevant information around the bhajans of Shiva Sai Mandir Music, using one platform. 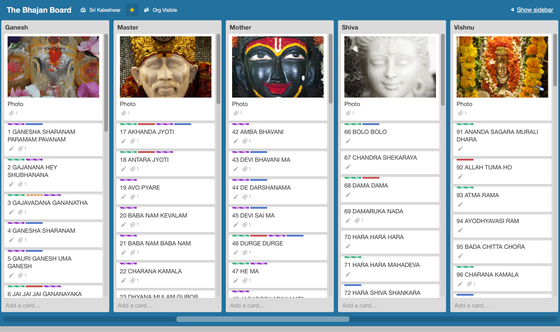 Another reason for us to create the bhajan board was to enable you to connect to the bhajans of your choice in your own individual way. For example, when we do concerts or workshops we choose from over a hundred of bhajans and narrow the choice down to a few bhajans that you will listen to at that night or weekend. But maybe your favorite bhajan is not among this choice. So there is a chance that you may favour for a bhajan which you have yet not listened to. With the bhajan board we like to give you access to all available audio and video files and more, so you have the chance to explore your own favourite bhajan, your own personal connection to the Deities on your own time and on your own space. As followed you will find a tutorial video explaining the bhajan board in depth and in the language of your choice. It also includes the necessary steps on how to setup a membership for the bhajan board. If you’d like to skip the tutorial you will find the steps on how to setup a membership below. Trello is the Plattform we use for the board. For help on creating a free user account on trello please see the tutorial video. The steps on how to create a user account on trello starts at timecode 24:04 in the englisch tutorial and at 25:52 in the german tutorial. 2. Write down your trello account name and close the trello page. 3. Back on this page, see the subscription below and choose the subscription of your choice. You can choose for a monthly subscription for 3,50€ or a annual subscription of 36,00€. 4. Click the “Add to card” button. The subscription is now in you shopping card. The shopping card appears on the upper left side on this page. 6. In the notes field write your trello account name. 7. Click "Next step" and finish the order. 8. Once we’ve received & reviewed your order, we add you to the board and sent you an eMail with an access link. 9. Enjoy the Bhajan Board :) We Do!